With scooters becoming more popular across the whole world, an increasing number of riding vehicles with powerful engines have started being manufactured and that too within a very short duration of time. The all new Honda Ruckus is all set to hit the roads in the year 2011 with its best design and powerful engine. It comes with an effortless electric starter and the best thing that you can get it from this scooter is its amazing fuel efficiency. You do not have to worry about filling up fuels when you go for long drives. When it comes to is engine type, it has single cylinder four stroke engine that helps to give you quick and fast pick ups. It has liquid cooling effect that helps to give the extra mileage without getting it hot. So you can zip down the town without having to worry about anything. It looks tough both from outside and inside. It is important that you test drive the 2011 Honda Ruckus and you would feel that you are on the top of the world with its smooth drive. Coming to its braking system, you would find that it comes with a front disk brake caliper. You would also find that the engine gets turned off three seconds when it stops in order to improve the fuel economy. You can also adjust the seats that would find very comfortable while riding. If you are thinking where to keep your helmet, then you would find that it has a very spacious storage area right under the seats and this helps your helmet from getting any scratches. Regarding the price, it has not been decided yet. When it comes to induction, it has a 15mm CV carburetor with automatic choke and CD ignition. It also has Automatic V-Matic belt drive that would give you good support while driving. It almost looks like a bike with the perfect handling and support and the features too looks like of that a powerful bike that can make you feel its speed down the road. It has front 120/90-10 front tires and 130/90-10 rear tires. 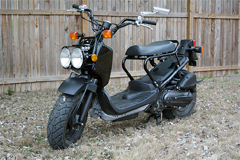 2011 Honda Ruckus comes with the front suspension of Twin-downtube fork. When it comes to its travel rear suspension, it has 2.2 inches. It has single shock rear suspension and it has 2.6inches travel suspensions that adds another feather to its cap. This scooter meets all the current carb as well as EPA standards. Coming to the radius of the wheelbase, it is 49.8. If you look at the height of the seat, it comes to around 28.9 inches and a fuel capacity of 1.3 gallons. The curb weight is around 194 pounds. If you are looking forward to buy this amazing feature scooter, then you should try and put forward your best efforts in getting all the required information or the specifications of the scooter. You should try to get the best color that would suit your personality. It comes in exciting colors like orange, blue, and black. Honda produces the most stylish bikes and when it comes to servicing, it provides you with the best service among all the reputed brands. You just need to make a call and you would get your scooter or bike serviced by their expert professionals. So you would be glad to get quick and best service from them without any problem. Honda brings you with different types of scooters and bikes that meets all your requirements and also ensures that you get the best out of your money. So you can become tensed free when you buy any Honda scooters or bikes. Keep your fingers crossed for the year 2011 to witness the all new Honda Ruckus and get to witness a riding experience like never before. You would be able to enjoy all the special features that would make you go crazy like never before. Do try to book in advance so that you get the scooter without waiting for a longer span. After all, you are going to be a proud owner of a power packed scooter with plenty of attitude.